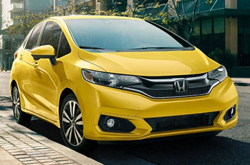 For 2018, the ultra-versatile Fit gets a major tech upgrade with the addition of Honda's Sensing highly advanced suite of driver-assist and safety technologies, designed to detect, alert and evade potential collisions before they happen. This quintessential 5-door subcompact car is now fitted with the highly sought after Apple CarPlay and Android Auto infotainment integration allowing seamless connection to mobile devices. Also new for 2018, the Fit receives upgraded suspension and steering for added handling and performance, as well as sound insulated glass for a quieter more comfortable ride. This year Honda unveils the all-new Sport trim, highlighted by aggressive aerodynamic underbody spoilers, 16-inch black alloy wheels and LED fog lights. The latest edition of the Fit comes in four different trims, the LX, Sport, EX and EX-L. This jack-of-all-trades hatchback is powered by an extremely efficient 1.5-liter 4-cylinder front-wheel-drive engine, available in 6-speed manual or CVT automatic transmission. 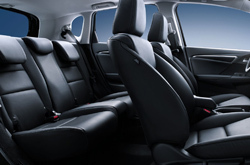 The surprisingly spacious 5-seat hatchback boasts a robust 52.7 cubic feet of maximum cargo room and 93 cubic feet of total passenger space, both outstanding for its class. The adjustable second row Magic Seat offers a variety of interior configurations to utilize every inch of available space for maximum cargo and passenger room optimization. The nicely equipped base LX trim comes standard with 15-inch steel wheels, a multi-angle rear-view camera, a 5-inch touchscreen Bluetooth enabled infotainment system and sound-insulated glass. Stepping up to the all-new Sport trim adds the racing-inspired style of sleek aerodynamic underbody spoilers, 16-inch black alloy rims, and an ungraded 7-inch touchscreen infotainment interface with Apple CarPlay and Android Auto. 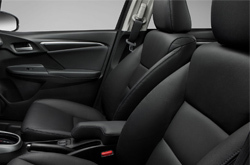 The EX trim is packed with standard premium features found on cars with much higher sticker prices like the all-new hi-tech Honda Sensing driver-assist and safety suite, LED fog lights, 16-inch alloy wheels and a leather-covered steering wheel and shifter. The top of the line EX-L adds luxury upgrades like leather-trimmed interior, heated seats and mirrors, and a 180-watt premium audio system. 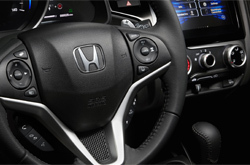 All trims feature an array of customizable colors and wheel options to choose from, as well as a full selection of genuine Honda Factory Performance interior and exterior modification options. 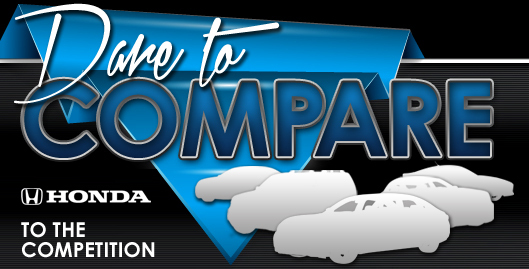 Honda has long been synonymous with quality and value and the Fit's 1.5-liter 4 cylinder front-wheel drive engine is no exception. With its staggering up to 31/40 city/highway mpg fuel economy, this highly efficient motor delivers 130 horsepower and 114 lbs-ft torque of practical reliable performance at an exceptional value. Available in both 6-speed manual or CVT automatic transmission with available paddle shifters, this down-to-Earth powertrain combined with the standard equipped high performance MacPherson front suspension and Torsion-Beam independent rear suspension deliver exceptional handling and an overall enjoyable driving experience. 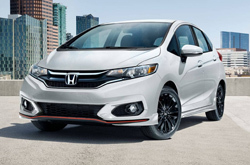 Honda's long distinguished track record for safety and reliability is exemplified in the 2018 Fit. 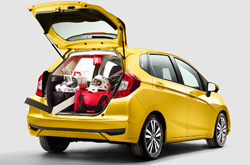 The Fit incorporates Honda's all-new Sensing suite of driver-assist and safety technologies that use a network of radar sensors and cameras working in conjunction with the car to monitor, detect, alert and evade potential collisions. The Sensing suite features, the Collision Mitigation Braking System, Road Departure Mitigation System, Adaptive Cruise Control, and Lane Keeping Assist System that actively monitor for danger and automatically adjust power, brake and steering to proactively avoid any threats before they can become emergencies. What are you waiting for? Find your Fit now!